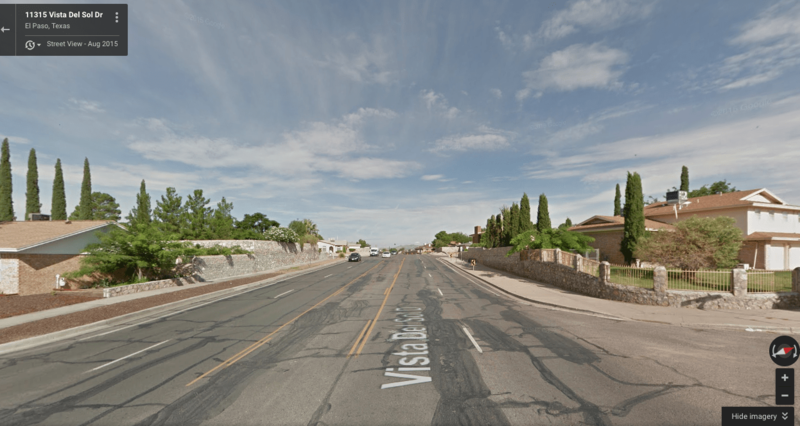 Wide lanes, lack of medians, wide corners, and wide open views all tend to encourage people to drive faster through the El Paso neighborhood where Eduardo Dill was killed. Tragedy struck El Paso again on September 22, when 27-year-old Susanna Lozano, driving her F-150 pickup truck, struck and killed 53-year-old Eduardo Dill as he attempted to cross a neighborhood street in his electric wheelchair. Police said that the “contributing factor” to the crash was Dill’s “failure to yield the right of way,” according to El Paso Proud, because he was not in a crosswalk. Blaming the victim of a fatal crash is all too typical in El Paso and other Texas cities. But if we continue to chalk up traffic fatalities to the behavior of victims, we won’t make progress in preventing them. Last year, 48 people were killed in crashes on El Paso streets. In 2016, the death toll is on track to rise significantly, according to KFoxTV. Police say there have already been 50 traffic fatalities so far this year. In this case, the questions we should be asking are: Why did Eduardo Dill attempt to cross Vista Del Sol Avenue where he did? And what can be done to prevent similar crashes in the future? 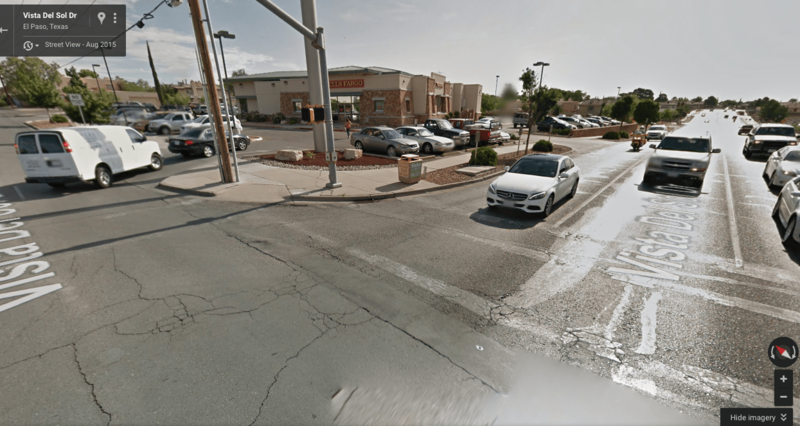 There are two very significant details that the police and news outlets never dwell on but which clearly stick out if you explore the area using Google street view: High traffic speeds and a lack of safe crossings on Vista Del Sol Avenue. Speed is one of the leading contributing factors to traffic deaths in Texas. For decades, we have designed streets assuming that Texans will drive cars at speeds virtually guaranteed to kill pedestrians, bicyclists, and people in wheelchairs upon impact. While El Paso has a Complete Streets policy, it does not explicitly call for designing streets like Vista Del Sol for safe traffic speeds. A motorist traveling at 20 mph has a much better chance of reacting to avoid collisions with pedestrians than a motorist traveling at 40 mph. And in the event of a collision, 95 percent of the time a pedestrian will survive a crash with a vehicle at 20 mph, but the odds of survival are only 15 percent at 40 mph. Vista Del Sol is designed for car travel at speeds of 40 mph or higher. Clearly, Lozano was traveling at a speed sufficient to kill Dill on impact, but she probably felt she was driving at a normal speed, given the way the street is designed. The City of El Paso ADA Transition Plan is refreshingly clear, with goals, objectives, reasonable cost estimates, and a timeline to complete the desired improvements. However, the El Paso plan does not mention the problems posed by long stretches of road with no safe crossings. The failure of a person walking, riding a bike, or using a wheelchair to “yield right of way to a vehicle” is listed as a contributing factor in 107 fatal crashes in Texas last year. Many of these incidents occur on streets with no safe way for pedestrians to cross, as was the case on Vista Del Sol Avenue. Dill was crossing at the intersection of Bessamer and Vista Del Sol, a little less than 2,000 feet from Lee Trevino Drive, where you can see the closest marked pedestrian crossing. If he had chosen to travel along the sidewalk on Vista Del Sol to this intersection and return to Bessamer, he would have had to travel an extra three quarters of a mile. He also would have to cross 10 streets with intersections designed for motorists to cut corners, then navigate the light at Lee Trevino Drive. Since most powered wheelchairs travel between 3 and 5 mph, this circuitous trip would have taken Dill at least an extra 20 minutes. To the east, the closest crosswalk is Billie Marie Drive, a little more than 2,000 feet away. Eduardo Dill simply had no good options. This is the intersection Eduardo Dill would have crossed had he chosen to go the extra mile for a pedestrian signal — faded, minimal markings on an extremely wide street, dangerous curb radii, and a ramp that points out into the middle of the intersection. The Cities of Austin and San Antonio have both adopted Vision Zero goals to end traffic deaths through comprehensive effort, involving public works, police, health, planning, legal, analytical, and communications staff in the effort to get at the root causes of traffic deaths and serious injuries, and actually reduce the number of crashes on Texas streets. After an unacceptably dangerous year, El Paso should have a citywide discussion on what it values in its streets and transportation system. Does the city of El Paso prioritize the lives of all its residents enough to ask the difficult questions and take steps to save lives and provide the people of El Paso with a safer transportation system? If we're going to reduce traffic deaths, we need to start with roads like Roosevelt Boulevard in Philadelphia.